Once you have completed your work on a new product—whether it is a book, a record, a new CD series, or even a blog—you will probably have some time before it is available to the market. This is the perfect opportunity to get your ducks in a row and prepare for the launch. This is a resource page designed to equip them with all the tools they will need to do their job and help you get the word out. I suggest that you include the following eight components. You can alternatively split these into separate pages. I’ll provide some examples at the end of this post. Navigation. Provide a “table of contents.” This provides an overview of the page and a quick way for your visitor to navigate to the parts of the page that are most relevant to him or her. For example, I did this on my Speaking page. Though it’s not a Media Kit per se, it will give you the idea. If you are going to provide an email address, use a link and encode it, so you don’t attract a lot of spam. Also, provide links to your social media profiles, including Twitter, Facebook, Google+, etc. Product Information. Provide all the basic product information in one place. Don’t make your readers hunt. Sales Copy. Provide both short (1oo words) and long versions (300–500 words) of your sales copy. Product Specs. List the simple product or technical specs. For a book, this would include format (hardcover, paperback, etc. ), publisher, publication or availability date, ISBN or product number, product dimensions, shipping weight, and suggested retail price. Product Formats. List any additional product formats the product might be available in. For a book, this could include digital formats, foreign editions, etc. Ancillary Products. List any ancillary products: premium editions, signed editions, DVD study materials, merchandise, workbooks, seminars, conferences, etc. This could be anything organically-related to the primary product. Product Trailers. First, there were movie trailers. Then there were music videos. Now, there are great trailers for books. In fact, some creatives produce more than one. Make sure they are uploaded to a site like Vimeo (my personal preference) or YouTube, so people reading the page can embed them on their own site or blog. Full Bio. I would also provide a short version (100 words) and a longer one (300–500 words). Don’t make this look like a resume. You only need to include what is relevant to this page’s audience. Headshots. Provide several headshots of yourself. You should provide several photos in several sizes. I provide formal, casual, and “action” shots. Product Endorsements. This is where you include all the celebrity endorsements. Try to get authority figures in your category. If you can’t get that, shoot for people with impressive credentials. If you can’t get that, customer endorsements are better than nothing. I explain how to do this in a previous post. Promotion Information. Most readers won’t be interested in every aspect of your marketing strategy. However, your live appearances (e.g., speaking events, concerts, etc.) and media appearances (e.g., radio, television, etc.) will be relevant to both professionals and fans. Live Appearances. Provide a list of your upcoming speaking or concert dates. Include links so readers can get additional information. Here’s an example from my own Speaking page. Media Appearances. Provide a list of your upcoming media appearances, so that producers, event planners, and fans can tune in. You might also include highlights from previous appearances. Bio Talking Points. This is similar to your bio, but in a talk points format instead of a narrative. This makes it easier for the interviewer to make it sound natural. Here’s an example (PDF) of something similar I provide to those who introduce me before I speak. How to Sound Like You’ve Read the Book (or used the product). This is a brilliant idea that I got from Robert Smith, Andy Andrews’ manager. He recognized that 95% of interviewers will never read Andy’s book. This is my experience as well. But they want to sound like they have read the book. This is an opportunity for you to summarize your product and make the interviewer look smart. List of Interview Topics and Angles. Again, in the spirit of making it easy for producers to book you, provide a list of interview topics and angles. Make them relevant to what people are already talking about. This is one section you will likely need to update as the current news changes. Sample Interview Questions. 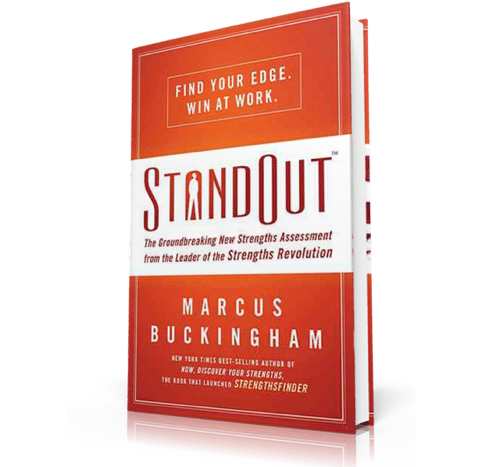 This is the single most important thing you can do to get more, high quality interviews. Develop a list of 7–10 interview questions. This allows both you and the interviewer to look smart. Fan Resources. It’s great to have fans. It is even better to turn fans into evangelists. But in order to do this, you have to equip them to work on your behalf. Sample Chapters. Give your fans something to share with others. One great tool is Scribd. Why? Because your fans can embed the sample chapters in their own blog in order to share it with others. Twitter Post Samples. I wrote about this a few days ago, but, again, make it easy. Give your followers 10–30 sample tweets. Suggest a hashtag, so you can track all the tweets in one place. Banner Ads. Commission the design of banner ads that your fans can put on their own blogs or websites. These are cheaper than you think. Just search Google for “cheap banner ad design.” You want to create ads for all the standard banner ad sizes. Incentives. Give people an opportunity to connect with you based on how many of their products you buy or what they are willing to do to promote them. Gary Vaynerchuck and Phil Cooke are two examples of this. Be creative! Wallpaper. Some of your fans want “digital bling.” They identify with your brand or your product more than you may thing. They will proudly display it on their computer. What can be more personal than that? A good designer can crank out wallpaper using your exiting graphics in less than 30 minutes. Merchandise. Some of your fans want “physical bling.” Again, they identify with your brand or your product so much that they are willing to wear it, display it, or drink from it. My friend, John Richardson, recently outlined several possibilities, including links to vendors. The idea here is to share endorsements and enthusiasm from your fans to fuel even more enthusiasm. 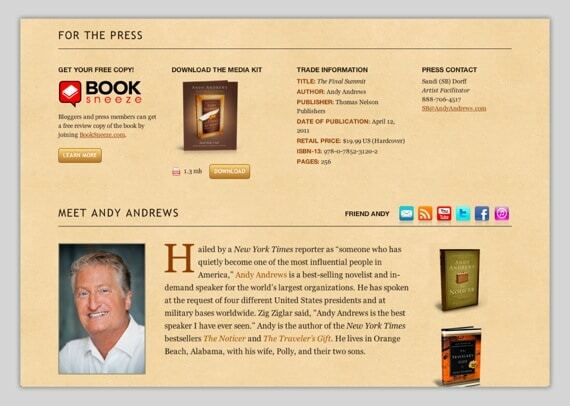 The best example of a media kit I have ever seen is the most recent one for Andy Andrews newest book, The Final Summit. It meets nearly all my criteria. (And it gave me a lot of ideas I had not thought of.) Make sure you download the PDF as well. Also, check out the online media kits for Dave Ramsey’s new book, EntreLeadership, Dov Seldman’s book, How: Why How We Do Anything Means Everything, and Jenny Blake’s book, Life After College. If you want to equip your potential partners and fans to get the word out, you will take the time to to build a great online media kit. Question: How could an online media kit like I have described help you mobilize the troops? You can leave a comment by clicking here.